required is greatly reduced. The labor involved in slab form concrete casting is much less than that involved in filling a high wall form. One side of a precast unit cast as a slab may be finished by hand to any desired quality of finishing. The placement of reinforcing steel is much easier in slab forms, and it is easier to attain thorough filling and vibrating. Precasting of wall panels as slabs may be expedited by mass production methods not available when casting in place. Generally, structural members, including standard highway girders, poles, electric poles, masts, and building members, are precast by factory methods unless the difficulty or impracticability of transportation makes jobsite casting more desirable. On the other hand, concrete that is cast in the position that it is to occupy in the finished structure is called cast-in-place concrete. 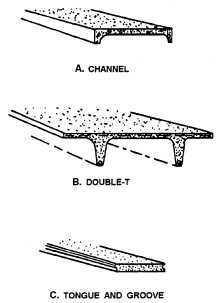 The most commonly used precast slabs or panels for FLOOR and ROOF DECKS are the channel and double-T types (fig. 3-17, views A and B). Figure 3-17. - Typical precast panels. 50 feet. If desired or needed, the legs of the channels may be extended across the ends and, if used in combination with the top slabs, may be stiffened with occasional cross ribs. Wire mesh may be used in the top slabs for reinforcement. The longitudinal grooves, located along the top of the channel legs, may be grouted to form keys between adjacent slabs. The double-T slabs vary in size from 4 to 6 feet in width and 9 to 16 feet in depth. They have been used in spans as long as 50 feet. When the top-slab size ranges from 1 1/2 to 2 inches in thickness, it should be reinforced with wire mesh. The tongue-and-groove panel (fig. 3-17, view C) could vary extensively in size according to the design requirement. They are placed in position much like tongue-and-groove lumber; that is, the tongue of one panel is placed inside the groove of an adjacent panel. They are often used as decking panels in large pier construction. Matching plates are ordinarily welded and used to connect the supporting members to the floor and roof slabs. Panels precast in a horizontal position, in a casting yard or on the floor of the building, are ordinarily used in the makeup of bearing and nonbearing WALLS and PARTITIONS. These panels are placed in their vertical positions by cranes or by the tilt-up procedure, as shown in figures 3-18 and 3-19. Usually, these panels are solid, reinforced slabs, 5 to 8 inches in thickness, with the length varying according to the distances between columns or other supporting members. When windows and door openings are cast in the slabs, extra reinforcements should be installed around the openings. A concrete floor slab with a smooth, regular surface can be used as a "casting surface." When this smooth surface is used for casting, it should be covered with some form of liquid or sheet material to prevent bonding between the surface and the wall panel. The upper surface of the panel may be finished as regular concrete is finished by troweling, floating, or brooming. SANDWICH PANELS are panels that consist of two thin, dense, reinforced concrete-face slabs separated by a core of insulating material, such as lightweight concrete, cellular glass, plastic foam, or some rigid insulating material.